Long out of print - now for the first time in eFormat. Over the last 11 years Peter Arcane's Zodiac KeyWords has become a bit a cult classic. Initially limited to 50 copies its long been sought after. Well now it's been released in electronic format for the enjoyment of those that perform miracles and missed out the first time round. 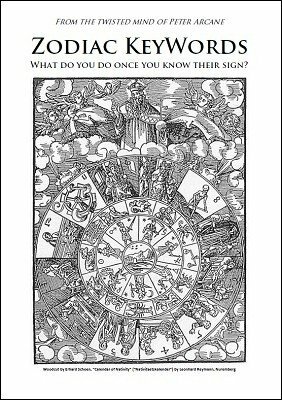 Zodiac KeyWords picks up where Ray Grismer's What's my sign? drops off. What do you do once you know their sign? Within the pages you'll find a technique that will allow you to take those next steps and present yourself as someone who has more than an understanding of the Zodiac and Astrology. 1st edition 2003, 19 pages.